We’re excited to have Olson President Margaret Murphy back to continue her series on customer loyalty with an issue crucial to marketers—using customer data for more successful direct marketing campaigns. Never has it been more important to go beyond collecting customer data, which is readily available, to transforming it and truly understanding your key influencers. Because if you don’t, someone else will. It’s not the amount of data that’s important. It’s how you use it that matters. Consider these five actionable steps to transform your customer data into better results. In Part 1 of this customer loyalty series, we discussed some considerations for getting your loyalty efforts under way, including the importance of capturing data. All well and true, but we need to face facts; all the customer data in the world won’t pay dividends if you can’t transform it into useful, actionable intelligence. At a time when every competitor is trying to get a share of the customer’s wallet, mind, heart and soul, it is vital that marketers go beyond simply capturing data and move toward greater customer-centricity and personalization. The key is in understanding your customer and the potential value they represent to your company’s bottom line. Not knowing them and trying to market to them is like shooting in the dark. It’s true, the answers lay hidden somewhere in your newly acquired data, but it’s how you use that information that will ultimately allow you to anticipate needs and target your best customers. Managing your data holistically and building out a holistic view of your customers is a big step in the right direction. It will enable you to gain a much more complete understanding of their behavior—what makes them tick, why they buy, how they buy, why they switch, what channels amid a plethora of channels they prefer, what their touch point activities are and if direct mail is driving them, just to name a few. 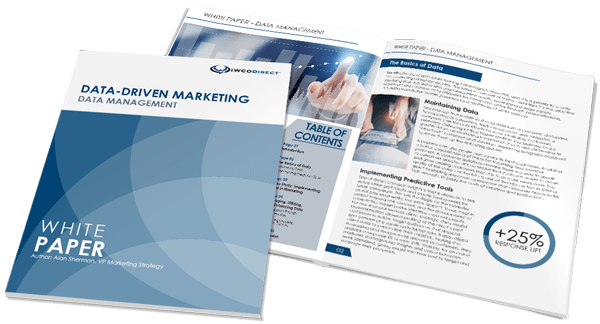 It can help you identify the resources and strategies needed to create a consistent brand and customer experience across all touch points. Once you get a bird’s eye view of desired customer experiences, you can begin to implement a lifecycle approach to your marketing efforts. You’ll be able to interact in relevant ways throughout the lifecycle, from acquisition efforts and onboarding to customer retention and growth to even winning back disengaged customers. You’ll be able to focus on your key value propositions, whether that’s product, access, service or rewards. By getting a better understanding of where they are in their lifecycle, you’ll know which customers are ready for new products. You’ll know your advocates from your early adopters. You’ll identify fluctuating levels of engagement. You’ll be better able to gauge what they want, when, where and why they want it. Ultimately, you’ll become more relevant to your customers, and your customers will become increasingly satisfied. Together, it builds advocacy. Today’s digital world has made customers more discerning than ever before. They’re informed, connected and skeptical. By using data holistically to discern where any given customer is in their lifecycle, what segment they fall into, and by reaching them with the right offers via their preferred channels, you’re creating relevance. You’re appealing to them in ways they perceive as valuable. You’re not sending them a coupon for baby diapers when you know they buy detergent. That’s a big win given that customers more than ever seek out the brands that understand their unique needs and interests. Customer loyalty builds over time and requires emotional underpinnings as well as cultivating meaningful engagements. It takes more than a big database and a few flashy communications to build real, long-term customer relationships. It’s not enough to simply throw a customer’s name in a variable field in a direct mail piece. When stitched together and analyzed appropriately, a holistic view of your customers, informed by your data, will drive incremental revenue to your bottom line. Margaret has more than 20 years of experience in marketing services. She assumed the role of President at Olson in February 2011 where she works internally and externally to integrate Olson's 520-person staff, seven offices and expanded capabilities. She has helped many Fortune 500 companies focus on building deeper relationships with their key audiences by identifying, developing and delivering insight-driven marketing strategies and initiatives. Click here to learn more about Margaret and Olson 1to1.